"Birds of Wyoming," a 432-page guide to the status and distribution of birds in the state, was recently published. Written by former University of Wyoming researcher Doug Faulkner, the book is available at some bookstores and from Roberts & Company Publishers. The University of Wyoming through an endowment provided by Robert Berry funded the writing and publication. 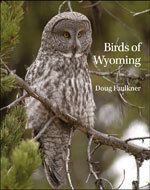 The book provides detailed information for more than 400 bird species known to have been in Wyoming through 2008. Each full-page resident species account features a species photo and distribution map, while the non-resident section provides insight on regular migrants and rarities. Introductory chapters written by state experts give an in depth look at the state's ornithological history, vegetative landscapes and avian conservation efforts. Habitat-focused sections by regional experts provide a broader view of management and conservation issues within Wyoming's dominant sagebrush, forest and shortgrass prairie ecosystems. "Birds of Wyoming" fills the niche for a state-based reference that will be useful to a wide range of professional disciplines and amateur birders. Faulkner spent six years at Rocky Mountain Bird Observatory before taking a position with UW to work on "Birds of Wyoming" full-time. He is now a biologist at SWCA Environmental Consultants, Inc., in Broomfield, Colo.